A hybrid flower photographed by makamuki0 and circulated under a CC0 license. Hybridization as a mode of cultural change was discussed prominently in Theorizing the Hybrid, a 1999 special issue of the Journal of American Folklore edited by Deborah A. Kapchan and Pauline Turner Strong. Like mestatisize, hybridization in the context of cultural analysis draws on biological imagery. Across the twentieth century, much of the heavy lifting in cultural anthropology, ethnology, and folklore studies was done with key concepts/words that related to identifiable modalities of cultural change. Diffusion was the core concept as these fields entered the twentieth century and a range of additional ones were identified, theorized, applied, refined, debated, etc. as the decades passed. Acculturation occupied a lot of attention, reorienting American cultural anthropology/ethnology in the process. The list grew longer and longer–innovation, socialization, enculturation, modernization, revitalization, missionization, colonization, decolonization, creolization, hybridization, globalization… No one mode of analysis or discourse predominated. Instead scholars in these fields accumulated a storage box of alternatives out of which they could draw at need. Some of these modes of thought and analysis have aged better than others. Some were criticized, some just came to be used less often. Some seem more relevant in the present than others. Most probably have their use now and will have in the future. But what additional terms or concepts warrant our attention now? Suggestions are very welcome. Here is an example. Deskill. Deskilling. (Deskillification?) I now hear this term many times a week in a range of contexts. It seems like a candidate for possible inscription on the scholarly list of cultural/social change concepts. What about the more poetic transfers into cultural analysis. Borrowed from medicine, metastasize is being used more and more in discussions of cancer-like social processes. In more workaday work, folklorization is now well established as is traditionalization. On this model, it is not surprising that heritagization is also now in widespread use. Are there any comparable core concepts that we have not yet transformed in processual variants? Some terms come towards us from, for instance, the business world. Do folklorists, ethnologists, and cultural anthropologists need to put our own spin on disrupt? I recently spent an extended time in Tartu, Estonia. I had the wonderful opportunity to be a Fulbright Specialist visiting the Departments of: (1) Estonian and Comparative Folklore, (2) Ethnology, and (3) Estonian Native Craft at the University of Tartu. My visit also provided rich opportunities to learn about the work of the Estonian National Museum, with which these departments collaborate closely. Visiting Estonia was a transformational experience for me and I am very grateful for my generous hosts in Estonia and for the continued work of the [U.S. Department of State’s] Fulbright Program. Here I reflect briefly on the work of my fields at the University of Tartu. In a later post, I will evoke the courses that I taught and the students I met while in Tartu. In a final post, I will touch on the Estonian National Museum and the rich International Committee for Museums and Collections of Ethnography (ICME) conference that it recently hosted. On the left, with the mural on its end, is Ülikooli 16 in Tartu on the University of Tartu campus. It is today home to the Institute for Cultural Research, which includes the Departments of Ethnology and of Estonian and Comparative Folklore. The Departments that hosted me have longstanding and strong undergraduate and graduate programs, but a new joint MA program was one catalyst for my visit. Having just welcomed its second cohort of students, the Folkloristics and Applied Heritage Studies program is an English-language masters degree program attracting strong students from around the world (including the United States). It is taught and managed in partnership between these units. I taught two short-term courses while visiting campus (see later post) and met with colleagues and students both in Tartu and in the city of Viljandi, where the Department of Estonian Native Craft is based. It and other arts programs are located in the Viljandi Culture Academy. Viljandi–about an hour east of Tartu–is a strong hub for the arts in general and for Estonian vernacular and folk arts in particular. For example, near Viljandi is a great satellite museum of the Estonian National Museum that is focused on handicraft and rural life (Heimtali Museum of Domestic Life) and Viljandi is home to the major Viljandi Folk Music Festival. Both in Viljandi and in Tartu, UT faculty were very generous and taught me much about their work and its contexts. As someone who teaches the history (and present status) of folklore studies, anthropology, and ethnology, it was extremely valuable to have a close encounter with the past and present of these fields in a national context that is inflected in both Northern European ways and in the Russian, Soviet, Post-Soviet ways. As throughout the region, issues of nationalism and national identity are a central theme, but colonialisms and their afterlives are also woven throughout the disciplinary histories. Estonia offers much to think about. This is not just a historical matter, as changes and innovations in Estonia society also offer many lessons. For instance, life at the University of Tartu is now heavily impacted by programs and initiatives of the European Union and technological mediation is a constantly present dynamic in the university’s educational work. While I am quite accustomed now with online and distance education, I was struck by the extensive role that these techniques play not only word-heavy curriculums such as in ethnology and folklore studies, but in the university’s native craft curriculum. Most students in this later department are older students (older, that is, than recent high school graduates) and they are learning advanced textile, metalwork, and building techniques as well as heritage studies methods and theories through a combination of intense-but-brief in-person work on campus and online education activities. My course on “Getting the Most Out of Peer-Review” was generously supported by the European Union, thus this sign was posted during class sessions. From colleagues in these departments, I also gained a deeper understanding of their impressive publishing work. Highlights include the Journal of Ethnology and Folkloristics (which I have long admired) and Studia Vernacula and a great diversity of monographs and edited volumes. Publication work in my fields is very advanced in the UT departments. The well-researched and beautiful books being produced related to Estonian craft techniques and histories are a marvel–little work of this quality is found in the United States. I could continue at near endless length, but this is enough for now. I close for the moment with warm appreciation for all of the staff, faculty, and students who worked hard to make my visit possible and who shared so much of their work and passion with me. Thanks also go to the Fulbright Specialist Program and to the European Union, the University of Tartu, and other funding agencies that supported my activities. Alternate title: How to give away $99,000 worth of articles. I write the following as founding editor of Museum Anthropology Review, an open access journal supporting scholarly and public-facing work in museum anthropology, museum-based folklore studies, and material culture studies. In an immediate context of painful collective disciplinary assessment, debate, and reflection (#hautalk) on scholarly communication work (and labor practices, and power, and hierarchy, and practices of discrimination, etc.) in the ethnographic disciplines, I thought it might be useful to be more explicit about labor and funding underpinning MAR). While the journal has a complex origin story and has changed alongside other changes (in my career, at Indiana University, in the fields that it serves, etc. ), the so-called business model has remained pretty consistent, making this small task easier. It is not the business school way, but it may be easiest and most contextually relevant in MAR and disciplinary context to track labor and money using participant roles. It is hard to do this in a way that will not seem either self-promoting or defensive, but it has to be done. I have stressed throughout my wider engagements with open access that projects such as MAR need to try to be intentional in their experimental work and in reporting back to the field for collective benefit. The need for more of this is more pressing now than ever and I have been relatively silent on open access issues since finishing what I thought of as capstone activities in two pieces written with colleague-collaborators (Jackson and Anderson 2014; Walters et al. 2015 [for this project, see also here]). Authors: The journal does have authors. Authors are not paid for their contributions to MAR, but they are also not charged author fees or article processing charges, as is common in some other kinds of open access projects. In MAR we have so-far published 33 peer-reviewed articles. Had the authors of those articles published them in Curator and paid to make them open via Wiley’s Online Open program, the total cost to authors would have been $2500 x 33 = $82,500. Author-pays open publication in Museum Anthropology would have cost $3000 x 33 = $99,000 (See Wiley-Journal-APCs-2018MAY24 (a spreadsheet) via https://authorservices.wiley.com/author-resources/Journal-Authors/licensing-open-access/open-access/onlineopen.html, accessed June 16, 2018). Those of us in other MAR other roles wish, of course, that authors were more aware of these taken-for-granted things. Hopefully this post will help a bit. I am proud that the MAR community has been able to make publication happen for these authors and their readers without ability-to-pay being a factor shaping the publication process. I also thank journal’s authors for sharing their valuable work widely through publication in MAR. Editorial Board: As is normal, MAR has a valued editorial board. As is common, I have not turned to them for structural, business or governance issues as much as I might have. As in other journals, they often serve as a kind of meta- peer-reviewers. For instance, serving as a source of editorial advice when I need help figuring something out or as a source of recommendations for reviewers. Sometimes editorial board members are called upon to undertake peer-reviews themselves. As with all journals that I know (and this is relevant in the context of the current journal controversies in the ethnographic fields), they also lend their reputations to the journal as a project. This is not inherently bad and it has a function beyond the accumulation of symbolic capital. When a potential author considers making a submission to any journal, they can review the masthead and ask: “Does my work resonate with the work of some of the people identified here?” Editorial Board Members are not paid for their MAR service. I thank them for encouraging and supporting the journal and helping it go. A special member of the editorial board during the initial years of MAR was Associate Editor Kimberly Christen. As reflected also in her important scholarship (example here) and her own large and innovative projects (example here), Kim was a key interlocutor for me on (then new) questions of open access, helping me make sense of the shifting terrain across which MAR would travel. Editor: At the most, two people have worked in the editorial office. Quite often, one person works in the editorial office. If there is just one person, then that person has been me. MAR launched in 2007. The story of its birth and its transformation is a different story and I postpone telling it here. A large number of friends and colleagues have helped by occupying the roles that I have noted above and by offering a range of encouragements and words of appreciation. The duties that traditionally fall to an editor are the ones that I have pursued. In the MAR case, this also includes overseeing the journal’s reviews work (book, exhibitions, etc.). This is a smaller setup than is normal even in smaller journals, which typically have a book review editor and other separated roles. There is no doubt that a critic would say that this concatenation of roles represents a concentration of power. I hope that close independent analysis would suggest that no pronounced problems flowed from this fact. For better or worse, it was also a concentration of so-called “service” labor. Understanding the finances of the editorial office can help readers judge the risks and ethics. The actual production of the journal is also done in the editorial office. Content does not get handed off to a publishing partner for formatting, metadata coding, assignment of DOI numbers, etc. That work happens in-house and it is the editor and (when existing) the editorial assistant that do that work. As described below, Indiana University has created an excellent open access publishing environment that makes this possible. As I still do, I held a tenured professorship when MAR sprang up into existence. As reflected by my notes above (and the points remaining to be made below), no money comes into MAR and no money goes out of MAR. There is no direct financial benefit to me to work on MAR. I acknowledge that I am paid well by Indiana University in support of the range of teaching, research, and service activities in which I engage and that I am reviewed annually and in the context of promotion decisions. No pressure to stop doing MAR has ever arisen (although my colleagues may privately question my judgement vis-à-vis excess editorial activity) and no special reward for doing it has been provided. My departments are home to a lot of editorial activity and mine just conforms to this local norm. This is a longstanding tradition, with many journals previously edited in them (Museum Anthropology, International Journal of American Linguistics, American Ethnologist, etc.) and many founded in them (Ethnohistory, Anthropological Linguistics, Journal of Folklore Research, etc.). If I did not do work on MAR I would be working on other things and my salary would not, I think, be any different. [I am mindful of the luxuries of choice available to me in my position.) MAR keeps me connected to my scholarly community and has brought a huge range of valuable experiences and relationships into my life. But there is no money to follow. Before 2013, MAR had only a kind of informal social base. It was produced by me and my friends with help from the IUScholarWorks program at the Indiana University libraries (see below). After 2013, MAR became the journal of the the Mathers Museum of World Cultures (MMWC). This was a positive byproduct of my becoming the MMWC’s Director. When my Directorship ends, MAR will remain at the museum and will be the responsibility of its next Director to continue, expand, shrink, change, or shutter. (Note: If the journal were to end next month or next year or next decade, the robust preservation and continued public accessibility of its backfiles is one of the durable commitments that IU Libraries have made to the project. See IU ScholarWorks below). Editorial Assistant: When I was help in the work of the Editorial Office, it was by a graduate student from the Department of Folklore and Ethnomusicology or Department of Anthropology at Indiana University holding an .5 FTE (half of fulltime) graduate assistantship. Whereas the College of Arts and Sciences at Indiana University specifically funded a .5 FTE graduate assistantship for the work of supporting my previous editorship (2005-2009) of Museum Anthropology (the journal of the Council for Museum of Anthropology), MAR was never directly supported in this way. During a year serving as a department chair (2009-2010), a graduate assistant was assigned to support me in my scholarly activities. Helping with MAR became this colleague’s key duty. Between becoming Director of the MMWC in 2013 and the end of Spring 2017, the primary duty of a graduate student similarly appointed has also been to help with the journal. During fall 2017 and spring 2018, the work of the MMWC Director’s Office graduate assistantship has broadened to other projects, but the incumbent did do some MAR work. When a graduate student was working primarily on the journal, they held the title Editorial Assistant and appeared thus on the MAR masthead. When filled, this Editorial Assistant role was a 20 hour per week position held during the fall and spring semesters. Those holding it have had the same stipends as their classmates holding similar appointments in the Department of Folklore and Ethnomusicology. They also hold fee waivers that pay for a significant portion of their course work for the full year (including summer courses) and they have a university health insurance plan. I wish that all of the assistantships held by students in my home departments (Folklore and Ethnomusicology, Anthropology) were better paid and offered better benefits, but I am happy that those student colleagues who worked with me on MAR had as good of a deal as any of their classmates. They can speak for themselves, but I think that they appreciated the experiences that they had while working on the journal. The rich range of publishing opportunities provided to graduate students in my departments have, over time, made (what I perceive to be) a significant difference in the career outcomes of the graduate students with whom my faculty colleagues and I have thus worked. The key thing to note here vis-à-vis broader debates in anthropology publishing right now is that MAR’s basic editorial office work (correspondence, copyediting, layout and formatting, social media stuff, etc.) was either done by me or by a graduate student being paid to work with me. * Given its small scale and lack of cash in and cash out practices, MAR could have been done with a wider pool of volunteer laborers. I actually support this model and have spoken up for it often, but in the actual doing, the mix of roles described here made sense to me for MAR. In part, this stemmed from MAR being an off-shoot of Museum Anthropology which, for a time, was run with as many variables as possible being held constant so as to provide a kind of natural experiment to contrast open access and conventional publishing in the sub-field that both journals served. The mode of editor (or pair of editors) plus assistant has been constant with Museum Anthropology from the time of my editorship and thus through the period of MAR’s history at issue here. Creating opportunities to support the work of graduate students interested in museum ethnography was always a key concern of mine in this work. It motivated my seeking the Museum Anthropology editorship in 2005 and it has remained a prominent goal throughout. I thank the College of Arts and Sciences and the Office of the Vice Provost for Research for supporting the assistantship positions that have at various points helped MAR prosper. I thank Janice Frisch (2019-2010), Teri Klassen (2014), and Emily Buhrow Rogers (2014-2017) for their hard work as editorial assistants with MAR. IUScholarWorks: MAR would not be possible without the extraordinary vision, investment, and labor gathered in the IUScholarWorks program of the Indiana University Libraries. Focused on supporting open access scholarly communications efforts, IUScholarWorks (IUSW) has a number of signature projects, including Indiana University’s institutional repository and the IUScholarWorks Journals program. MAR was the first of the IUSW supported journals. This program has grown to include more than forty open access journal titles, including others of relevance to the ethnographic disciplines (Anthropology of East Europe Review, Ethnomusicology Translations, Studies in Digital Heritage, etc.). I am not able to quantify the financial investments that the IU Libraries have made in MAR via the IUSW program, but the investment is significant and important. Most crucially, it is via IUSW that MAR has access to the incredible open access journal hosting and workflow software known as Open Journal Systems (OJS). OJS makes MAR possible and the IUSW librarians and staff make MAR on OJS possible. I want to express appreciation for the investment and incredible support that the IU Libraries have provided to me and to the MAR project. I hope to say more about the details of this support in the future and to quantify the technical and staff costs underlying it. For now, it may be enough to know that just as MAR tries to serve the field without charging fees for that service, IUSW tries to serve projects like MAR without charging fees for that service. It is certainly the case that economies of scale have been realized by having library-based publishing support services that can concurrently help a wide range of (mostly small) journal projects. Indiana University Press: Technically, I could speak of the IU Press alongside IUScholarWorks. At Indiana University, our wonderful press is now a unit inside the IU Libraries. In this position, there is significant overlap and interdigitation between the open access publishing support work of IUScholarWorks and the general publishing work of the IU Press. But the two efforts also preserve some distinction. One way that MAR is increasingly being served by the IU Press is through promotion. As an outgrowth of the Press’ own commitment to fostering open access publishing, the Press has generously promoted MAR alongside its full suite of scholarly journals. As with the libraries as a whole and IUSW in particular, I cannot say enough good things about our press. The open access-fostering work of the Press, IUSW and the libraries in general are an outgrowth of a larger campus-wide and university-wide commitment that has been a key factor in the success of MAR and other OA (related) projects (JFRR, Material Vernaculars, Open Folklore) in which I have participated. I am appreciative of this support even as I cannot put a dollar figure on it. The key thing here is that MAR had not had to pay the IU Press to promote the journal (through print and web ads) just as it has not had to pay the libraries for IUSW services. Conclusion: Responding to current calls for transparency in the work of open access journals is important. When I edited Museum Anthropology for the Council for Museum Anthropology Review, I was required to prepare and present annual editor’s reports that provided the board, the membership, and the AAA an auditable record of the journal’s editorial work and the financial realities of the journal in relation to the finances of AAA vis-à-vis its (then) publishing partners (University of California Press –> Blackwell/Wiley-Blackwell). By their nature, more emergent and grassroots projects (like MAR) lack formal institutional structures and thus they lack baked-in prompts for recording and reporting the facts of their existence. I hope that the accounting that I have provided here shows how one such project has functioned, particularly in terms of the flow of in-kind services. If cognate projects to MAR can also respond to calls for more public sharing of their underlying circumstances, the larger project of building a more equitable and sustainable system of scholarly communication can be advanced. I regret now not putting the facts noted above into written form sooner. Rather than end though on regret, let me close with a final word of appreciation to all of those who have provided the in-kind labor or financial support or technical infrastructure that has made MAR possible. See what you think of the results at: https://scholarworks.iu.edu/journals/index.php/mar/issue/archive. *For the first time in MAR’s history, I paid a freelance copyeditor to edit three article manuscripts last month. Other duties prevented me from doing this work in a timely way and the assistantship role is not filled during the summer months. I paid for these edits out of discretionary funds raised through my involvement in other non-journal projects. Noting this fact allows me to record the value I place on the contributions that publishing professionals make in scholarly communication work. The DIY nature of MAR is an outgrowth of its nature and scale and is not a repudiation of professionalism in publishing work. Opposition to large corporate publishers is not the same thing as opposition to all publishers. I have devoted significant effort to supporting university presses and I try to be an ally to university press colleagues. Late last month, I was fortunate to have a chance to return quickly to Beijing as a member of an Indiana University delegation visiting the Chinese Academy of Social Sciences. Happily CASS is a scholarly powerhouse in general and it possesses special strengths in folklore studies/ethnology. It was a whirlwind visit during which I spoke four times in four days. A promotional sign for UCASS-Indiana University Academic Week at the University of the Chinese Academy of Social Sciences in Beijing, May 2018. My first engagement was not at CASS but with the world-renowned folklore program ( Institute of Folk Literature, formerly the Institute of Folklore and Cultural Anthropology) at Beijing Normal University. There my host was Professor YANG Lihui, a leading figure in international folklore studies and a key interpreter of the history and theory of the field. Professor YANG has helped explain developments in U.S. folklore studies to her colleagues in China and, reciprocally, worked to make the field as practiced in China more legible to non-Chinese scholars. (For example, see this article in Asian Ethnology with AN Deming.) My topic was the relationship between museums and folklore studies in the United States. My timing was auspicious, because in their coursework with Professor YANG, many of the graduate students had recently been reading and discussing just this topic (including work by by Barbara Kirshshenblatt-Gimblett, whose efforts were also touched on in my talk). The discussion that followed my presentation was rich and I greatly appreciated this chance to visit a leading program in our shared field. An account of my visit was kindly prepared by one of the participating students and published on the webpage of the School of Chinese Language and Literature. On my second full day in Beijing, I was a participant in a rich conference during which CASS and IU scholars across the breadth of the social sciences shared background on their home departments and institutes, as well as brief glimpses of their own scholarly work. I spoke about the work of folklore studies in the Department of Folklore and Ethnomusicology, the cultural anthropology faculty and training in the Department of Anthropology, and the Mathers Museum of World Cultures. Each of the IU faculty participating were paired with a CASS colleague. I was thrilled to be matched with an outstanding folklore scholar who has deep knowledge not only of the field, but about its status at Indiana University. 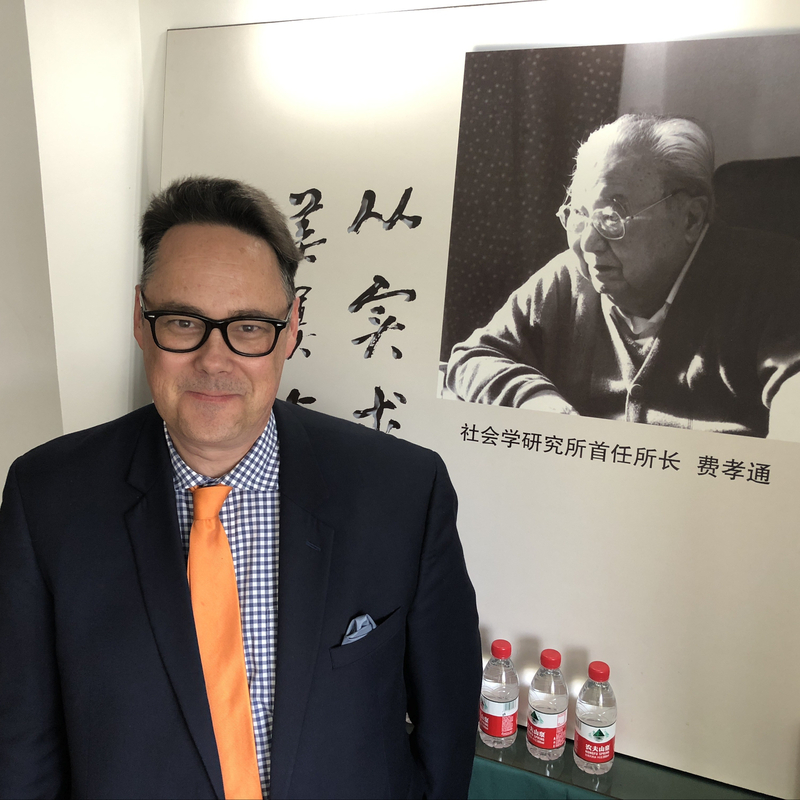 Like Professor YANG at Beijing Normal University, Professor AN Deming was a visiting scholar in the IU Folklore Institute and has maintained close ties with IU colleagues. Drawing on his background in folklore studies and his ties to IU, Professor AN’s warm remarks to the conference attendees really set the stage well for exploring possible initiatives that might link scholars at both institutions. We were the first pair of scholars to speak. In the presentations that followed, we learned a lot about CASS but also research expertise from an interesting range of scholars from across the full breadth of the social sciences, from the philological study of ancient scripts to the study of contemporary global economic shifts. On my final day in Beijing, I addressed a large group of (mostly) graduate students enrolled in the University of the Chinese Academy of Social Sciences. My topic was again ways of thinking about the concept of cultural heritage. As reflected by the photograph I share above, the University went to great lengths to promote the talks that my colleagues and I delivered. They branded our week of campus visits as “UCASS Indiana University Academic Week” and were extremely generous hosts. I appreciated the chance to learn about the graduate and (new) undergraduate programs at CASS and to see their immaculate campus in the Beijing suburbs. With my colleagues C.T. and P.W., I enjoyed a wonderful bowl of noodles in the campus restaurant. How great it would be to have such noodles on one’s campus! Manjiang village, a community within the Nandan Baiku Yao Ecomuseum. December 14, 2017. Photograph by Jason Baird Jackson. # The China-US Folklore and Intangible Cultural Heritage Project is a binational collaboration linking the China Folklore Society and the American Folklore Society. It has been underway formally since 2007 and has included multiple project phases and, in these phases, various sub-projects. A wide range of funders have supported the project and its work and a great number of Chinese and American scholars and practitioners have participated in its activities. Among U.S. participants, special attention is often given to the Henry Luce Foundation, which has been particularly generous in supporting several phases of the project (Lloyd 2017). # Two sub-projects occurring in two different phases of the project have a specific museum focus. Between 2013 and 2016, a sub-project titled “Intangible Cultural Heritage and Ethnographic Museum Practice” brought together six museums of ethnography—three from the United States and three from Southwest China. These museum partners organized two “Forum on China-US Folklore and Intangible Cultural Heritage” events, pursued professional exchanges of staff members, traveled together to visit local communities in the home regions of each museum, and undertook a joint exhibition and catalogue project. The resulting exhibition—Quilts of Southwest China has been touring the United States. The bilingual catalogue is distributed in the United States by Indiana University Press. These are just the formal highlights of the project. A wide range of spin-off projects and collaborative relationships also arose from this joint work (Dewhurst 2017; Du 2017; Indiana University 2013; Lloyd 2017; MacDowell 2017; MacDowell and Zhang 2016; Zhang 2017). # A new phase of the larger project began in 2017 and it also includes a museum-focused sub-project. The new project builds on relationships and experiences arising in the preceding effort. Between 2017 and 2019, the “Collaborative Work in Museum Folklore and Heritage Studies” sub-project is bringing together researchers from the three U.S. museums (Mathers Museum of World Cultures, Michigan State University Museum, Museum of International Folk Art) with colleagues affiliated with the Anthropological Museum of Guangxi (AMGX), as well as that museum’s partners in two local ecomuseums: the Nandan Baiku (White Trousers) Yao Ecomuseum and the Sanjiang Dong Ecomuseum. # The workshop (discussed in posts 6 and 7) was another formal part of the project, but the most crucial activity is ethnographic fieldwork in two communities—those associated with the two ecomuseums in Nandan and Sanjiang counties in Northern Guangxi. The December 2017 trip was for the first of four fieldwork efforts. On this trip, our local hosts and partners were the staff at the Nandan Baiku Yao Ecomuseum. A pet bird in a basketry cage in Huaili village. December 14, 2017. Photograph by Jason Baird Jackson. An ecomuseum is a museum focused on the identity of a place, largely based on local participation and aiming to enhance the welfare and development of local communities. Ecomuseums originated in France, the concept being developed by Georges Henri Rivière and Hugues de Varine, who coined the term ‘ecomusée’ in 1971. The term “éco” is a shortened form for “écologie”, but it refers especially to a new idea of holistic interpretation of cultural heritage, in opposition to the focus on specific items and objects, performed by traditional museums. The nature and potential of ecomuseums is a key research concern of our partners at the Anthropological Museum of Guangxi (more on that later). In a few final post or two, I will offer some highlights of our fieldwork experience. Here I explain our topic and circumstances. While in Nandan County, the project participants stayed in rooms connected to the offices of the Nandan Baiku Yao Ecomuseum. This offered our group the opportunity to reside in the village cluster where the museum is centered without necessitating staying spread among various host families. The simple guest rooms at the museum were created with this sort of visiting research use in mind. The arrangement meant that visitors and locals could interact meaningfully from early in the morning to late in the evening without being a burden to local families nor introducing the disruption and social separation that would have accompanied staying in a hotel distant from the communities at the center of the research. He Jinxiu, a Baiku Yao woman who is active in the work of the museum, a civic leader in the community, and a noted textile artist, was engaged to cook for the visitors with the help of a younger woman in her family and another younger woman Li Xiuying who is also a noted local textile artist. This arrangement was very appropriate to local norms and was generously arranged for by the local museum staff and supported by the AMGX. I know that the other American participants join me in expressing deep appreciation for the generous hospitality extended to us by all of our partners in the project and by the members of the contiguous villages of Huatu, Manjiang, and Huaili in which the ethnographic investigations were undertaken. Over the course of the research visit, the participants broke into three teams. Two of these teams focused on the nexus of textile arts and cultural heritage practices that are at the center of the project. These two research teams were made up of researchers from the American museums, from the AMGX, and from the Baiku Yao ecomuseum. Work by these teams was pursued in a mixture of English, provincial Mandarin, and the local Baiku Yao language. One of these two teams focused on fabric arts; the other focused on bamboo basketry and the related practice of incorporating woven bamboo into architectural structures such as wall screens, fences, and basketry-walled granaries. The fabric arts group documented weaving practices, indigo dying, embroidery, the making and use of clothing, and silk production. The basketry group was able to document the making of an elaborate basket from start to finish (in photographs, video, notes, interviews), inventory baskets found in two households, and document over fifty basketry types in active use. This group also interviewed a basket trader, recording the full range of types in his inventory with names, prices, uses, and other data. Bamboo harvested and stored for use in basket making at the home of Li Guicai in Huaili village. December 14, 2017. Photograph by Jason Baird Jackson. The third project team, comprised of members of the AMGX staff with assistance from the Baiku Yao ecomuseum staff focused on documenting the work of the project as a whole, with the goal of being in a position to produce articles and documentary video chronicling the work of the international partnership. The three American museums also each made collections during the course of this work. Much was learned and many questions for future research have been identified. The research concluded with travel to Nanning and, for the Americans, home to the US beginning on the 18th. In final post(s) I will share a richer glimpse of Baiku Yao cultural life and the people whom we we met. Jon Kay (R) and Li Guicai (L) at Mr. Li’s home in Huaili village. December 14, 2017. Photograph by Jason Baird Jackson. Dewhurst, C. Kurt. 2017. “Building Connectivity: China-US Folklife Collaborations.” In Metafolklore: Stories of Sino-US Folkloristic Communication, edited by Juwen Zhang and Junhua Song, 189-98. Guangzhou: Sun Yat-sen University Press. Du, Yunhong. 2017. “Ten Years: China-US Museum Collaborations in Retrospect.” In Metafolklore: Stories of Sino-US Folkloristic Communication, edited by Juwen Zhang and Junhua Song, 214-18. Guangzhou: Sun Yat-sen University Press. MacDowell, Marsha. 2017. “Reflections on Collaborations: The Quilts of Southwest China Project.” In Metafolklore: Stories of Sino-US Folkloristic Communication, edited by Juwen Zhang and Junhua Song, 199-207. Guangzhou: Sun Yat-sen University Press. ——— and Lijun Zhang, eds.The Quilts of Southwest China. Nanning: Guangxi Museum of Nationalities and Bloomington: Indiana University Press. Xie, Mohua. 2017. “My Two Stories.” In Metafolklore: Stories of Sino-US Folkloristic Communication, edited by Juwen Zhang and Junhua Song, 208-13. Guangzhou: Sun Yat-sen University Press. Zhang, Lijun. 2017. “My Involvement in the Museum Exchange Projects.” In Metafolklore: Stories of Sino-US Folkloristic Communication, edited by Juwen Zhang and Junhua Song, 221-27. Guangzhou: Sun Yat-sen University Press. In the previous post in this series, I described how my traveling companions and I visited Beijing’s 798 Art Zone. (For the series in order, see 1, 2, 3, and 4.) After that stop on December the 9th, we visited one more Beijing museum. This one was a new one for everyone. Carrie researched it and put it on our agenda—The Ethnic Costume Museum at the Beijing Institute of Fashion Technology (BIFT). We were uncertain what to expect, but we speculated that it would be a small university museum. It won’t take many words to tell the story. We were extremely impressed. The museum is not richly contextualizing and interpretive in approach (as more and more university museums work to be) but its collections are outstanding and they are beautifully presented in large, comfortable galleries. For scholars interested in dress, adornment, and textile history in China, it is a definite must-see. The Costume Museum at the Beijing Institute of Fashion Technology (BIFT), founded with the approval of Beijing Municipal Administration of Cultural Heritage, is the first museum specializing in ethnic costumes in China. The Museum is also a cultural research institute integrating collection, display, research, and teaching. BIFT Costume Museum covers a floor space of 2,000 square meters, with several major exhibition halls: Han Nationality Costume Hall, Ethnic Minority Costume Hall, Miao Nationality Costume Hall, Metalworking Jewelry Hall, Brocade Embroidery and Wax-printing Hall, Olympic Uniform and Ceremony Costume Hall, Picture Hall, and Hands-on Workshop (for teaching and academic exchange). As the top specialized costume museum in China, it has a fine collection of over 10,000 pieces of costume, accessories, fabric, wax printing, and embroidery. The collection is displayed in different categories, such as costumes of Miao nationality, metalworking jewelry, folk wax printing, and fabric. The museum also has a collection of nearly 1000 precious photographs taken during the 1920s and 1930s featuring the ethnic costumes of Yi, Zang, and Qiang nationalities. That is all true. Here I share some of our photographs from the visit, which was the high point of our day and great preparation for the work we would begin in Guangxi the next day. When we arrived, we noticed a sign that indicated that no photography was allowed. This left us crestfallen. We started taking in the exhibitions and noticed that all the other visitors were taking pictures and that the staff was completely aware of this. On investigation, it was flash photography that was prohibited. As a result of these factors, as well as the appropriately dark galleries (appropriate because textiles are being put on display for extended periods, raising the problem of light damage) our photographs are dark and rushed. In honor of our generous hosts in Nandan County, I present the Baiku Yao men’s outfit on display at the museum before posting a sample of other images from the museum. The “Men’s attire of the white-pants Yao branch of the Yaozu people” at the Museum of Ethnic Costumes. December 9, 2017. Photograph by Jason Baird Jackson. A scene from the Museum of Ethnic Costumes. December 9, 2017. Photograph by Jon Kay. A scene from the Museum of Ethnic Costumes. December 9, 2017. Photograph by Kurt Dewhurst. A scene from the Museum of Ethnic Costumes. December 9, 2017. Photograph by Carrie Hertz. A scene from the Museum of Ethnic Costumes. December 9, 2017. Photograph by Jason Baird Jackson. After visiting The Museum of Women and Children (See part 3 here), our group checked in with the Beijing arts neighborhood known as 798. (For background on 798, see wikipedia here, but know that the essay needs a refresh.) This area was the focus on an exhibition (just deinstalled last week) that I did last year at the MMWC with help from Luo Wenhong of the Yunnan Nationalities Museum. For Jon Kay, it was his first visit, but for Carrie Hertz, Marsha MacDowell, Kurt Dewhurst, and I it was a revisit. Jon already had a good sense of the place from our discussions (and from the exhibition photographs that he walked by almost every day at the MMWC since April). For the rest of us, it was our reaction that was new. The big new (to us) mural in 798 is a map of the district. It is a magnet for “I was there” photography. December 9, 2017. Photograph by Kurt Dewhurst. Carrie Hertz and a new-to-us mural in 798. December 9, 2017. Photograph by Jason Baird Jackson. The gold spider-like creatures were still there to greet us. December 9, 2017. Photograph by Jon Kay. We know well—from Wenhong’s historical and ethnographic work there and from our own brief visits—that the neighborhood is an always changing place. But this visit caused us to believe that 798 has really now turned another corner. Of the group, I had visited 798 most recently. In May 2016, I captured over 700 images of the neighborhood trying to document its sidewalk visual culture for the exhibition. (“Beijing’s 798 Art Zone” was presented at the MMWC from April 6 to December 17, 2017.) Discussing such things as the gentrification and new high-rise construction that presses in on the neighborhood, the increased presence there of major corporations and their promotional imagery, and a transition from confrontational street art to fun, selfie-friendly graffiti and amusing sculpture, I tried to suggest the ways that 798 is changing. I also tried to evoke some of the factors that were making the neighborhood a different kind of destination, while also noting the slipping away of the artistic cutting edge that other observers have noted. As my efforts were in the spirit of visual and urban anthropology rather than an effort in contemporary art criticism, I did not take a particular stance on these changes, just tried to convey a sense of them. All that to say that a contemporary arts district is not the kind of place that any of us would visit expecting to find cultural continuity. At the same time, our visit in 2017 did surprise us with how rapidly things can change. It is hard to sort out day-to-day, and season-to-season variations, but the contemporary-art-first version of 798 seemed defeated as judged by its street-level visual culture, as we experienced it last month. Some iconic graffiti and fiberglass sculpture remains. Some of the more robust galleries and retail shops are still there, but in the course of about nineteen months, a lot had disappeared or been degraded. Through its various earlier phases as an arts zone, a kind of playful-but-edgy aesthetics dominated the neighborhood’s visual culture. That aesthetic was haphazard in the sense that it was not centrally coordinated, but it was coherent in the sense that there was the kind of coherence that is the hallmark of many successful art colonies and artistic “schools.” The aesthetic last month had tipped over into the haphazardness of the flea market. (As folklorists, we love flea markets, but the change is noteworthy.) Unlike on recent visits, there was also a lot of empty real retail space. This is the location where the Sony exhibition site was in May 2016. On our visit the area around it was used for pop-up retail and sidewalk art for tourists. Presumably a new tenant would drive these users away. December 9, 2017. Photograph by Jason Baird Jackson. The 798 location for +86 Design Store is still open, but the offerings were fewer and seemed to have shifted with the tastes of the neighborhood’s changing visitor demographic. More cheap and goofy items, fewer clever design items, with an overall reduction in floor space and activity. December 8, 2017. Photography by Jason Baird Jackson. This is the location where the Sony exhibition site was in May 2016. See the related images for a clearer sense of how the location has shifted. December 9, 2017. Photograph by Jason Baird Jackson. This is the location where the Sony exhibition site was in May 2016. It looks to me like a spa has come and gone since then. December 9, 2017. Photograph by Jason Baird Jackson. Sidewalk artists creating rapid works on request were a minor presence on my visit to 798 in May 2016. On this visit, they were very common. December 9, 2017. Photograph by Carrie Hertz. Dragons and animals for sale on the street in 798. December 9, 2017. Photograph by Jon Kay. Different parts of the neighborhood are faring differently and, despite it being winter, there were plenty of visitors out walking and exploring the neighborhood. It is still, as described in the exhibition, a destination for making selfies and for more professional photo shoots. But emblematic of the newest incarnation of 798 for us was the store called in English “Iran”. As the name suggests, the store offers Persian art and objects. There are familiar kinds of objects such as woven rugs, but then there are (many) less familiar (to me, at least) paintings (?) on black velvet. Iran was crowded with people and crowded with what cultural critics in the west would call (perhaps misperceiving what they see) orientalist kitsch mixed with textiles, metalwork and other genres with less ambiguous roots in Iran. To see something what Iran in 798 looks like, check out this short YouTube video published soon after our visit. Iran seems to be part of a changing culture of exhibition in 798. As the edgy aura wears off, but as people continue to visit (but, it seems to me, to not spend very much money), the neighborhood becomes useful for quirky soft-power projects. Iran’s place in 798 casts a new light on the Israeli chamber of commerce’s presence in 798 (noted on my last visit) and its activities hosting expo-like events in the neighborhood. (Iran is almost across the street from the Israelis.) Along the same lines, 798 is similarly home to a branch of the Beijing Goethe Institut. 798 remains a place to get one’s picture taken. Here the Cafe Flat White provides the backdrop. December 9, 2017. Photograph by Jason Baird Jackson. Marsha MacDowell is sorting through the interior of Iran in 798. December 8, 2017. Photography by Jason Baird Jackson. Textiles piled up at Iran. December 9, 2017. Photograph by Jon Kay. As a winter day during the week, foot traffic in 798 was not intense, but Iran was full of people looking the very different kinds of objects displayed there. December 8, 2017. Photography by Jason Baird Jackson. The selfie stick is still an essential item in 798. December 9, 2017. Photograph by Jon Kay. The shift to a more random retail footing can also be seen in other new businesses getting going in 798. An example is the “Custom Barrrl [yes, three Rs, no E] Scotch Whisky Exchange”. The most dramatic new architectural presence is a building marked in English “798 Art Auction Center.” I have not found information online about what is going on with it. Custom Barrrl Scotch Whisky Exchange new to 798. December 8, 2017. Photography by Jason Baird Jackson. It would take a dissertation to sort this shop out. December 9, 2017. Photograph by Jason Baird Jackson. A huge new concrete building announces itself as the 798 Art Auction Center. December 9, 2017. Photograph by Jason Baird Jackson. Deal for Ullens Centre for Contemporary Art ends year of uncertainty, and director is hopeful its new status as a foundation will help it raise funds, improve its exhibitions and attract more visitors. It actually isn’t true that UCCA seemed unchanged at street level. Reviewing our photographs, I recall the shock I felt in seeing that the museum was hosting a bamboo basketry class. Those who know my own enthusiasms can imagine that I see this as a change for the better. Probably so, and in my book this is a rather cutting-edge thing for them to be doing, but still it would have seemed preposterous that UCCA would have had such classes at the time of our first visits there. (L-R) Jon Kay and Carrie Hertz check out UCCA in 798. December 9, 2017. Photograph by Jason Baird Jackson. In the midst of organizational change, UCCA was reflecting on its first ten years as a art venue in 798. December 9, 2017. Photograph by Jason Baird Jackson. I do not know what I was looking at when Jon took this picture of me, but it shows the sign for the “classic workshops” at UUCA, including the workshop on bamboo basketry. December 9, 2017. Photograph by Jon Kay. Is the Enjoy Art Museum closed temporarily or for good? December 9, 2017. Photograph by Carrie Hertz. UCCA has changed its retail operations, opening a store called dorm that focuses on books while staging photographic exhibitions. December 9, 2017. Photograph by Jason Baird Jackson. Other new developments: a decorate-your-own-ceramics place, more kid-oriented retail and amusements, lots of boutiques with sophisticated women’s wear, many street vendors selling the kind of foods one can get in Chinese city parks (candy glazed strawberries on a stick, for instance), and lots of card-tables-on-the-sidewalk retail of used and simple domestic goods (these in particular contribute to the flea-market vibe) and tchotchkes. As is true everywhere in Beijing now, rental bicycles are ubiquitous in 798 and they crowd at the entrances to the district. Since my last visit, this alley has been sterilized and an painfully upscale store with children’s clothes and toys has opened at the end. December 9, 2017. Photograph by Jason Baird Jackson. The upscale store with children’s clothes and toys. December 9, 2017. Photograph by Jason Baird Jackson. In Bloomington, Indiana we lost our make your own ceramic works shop, but a new one has appeared in 798. 99 Chinese Yuan equals about US$15. December 9, 2017. Photograph by Jason Baird Jackson. There are many more stores selling women’s wear in 798. December 9, 2017. Photograph by Jason Baird Jackson. A children’s theater? Puppets? More change in 798. December 9, 2017. Photograph by Jason Baird Jackson. This is the sign for the new location with a stage. December 9, 2017. Photograph by Jason Baird Jackson. Rental bikes are also now a presence in 798 and all of Beijing. December 9, 2017. Photograph by Jason Baird Jackson. Street food is now prominent in 798. December 9, 2017. Photograph by Carrie Hertz. Jon photographs Carrie photographing the engaged or newlywed couple in 798. December 9, 2017. Photograph by Jon Kay. Carrie’s Ph.D. dissertation is on the classic white American wedding dress, giving this scene extra interest. December 9, 2017. Photograph by Jon Kay. Of course, a series of quick visits and walkabouts are not the same thing as sustained attention, historical, ethnographic, or otherwise. It is not possible to fully understand the state and fate of 798 without deep knowledge of the political economy and culture of Beijing, China, and the international worlds of art, culture, and discourse in which these intersect and entwine. I am glad that there are in-the-know scholars working on these larger contexts in which 798 has a place. East-Meets-West collage and kitsch are still a part of 798’s visual economy. December 9, 2017. Photograph by Jason Baird Jackson. We saw evidence of fewer contemporary art exhibitions in 798 (perhaps that was just a seasonal thing), but as four curators and a director, we could not resist the English title of this one. December 8, 2017. Photography by Jason Baird Jackson. Not all of the public sculpture from my previous visit has been hauled off. I got to reconnect with these four. December 9, 2017. Photograph by Jason Baird Jackson. (L-R) Kurt Dewhurst, Marsha MacDowell, Carrie Hertz, and Jon Kay outside 798. December 9, 2017. Photograph by Jason Baird Jackson. I have no special appreciation for this piece. I had seen it previously near the entrance to 798 adjacent to the office that is something like a visitor center for the district. In this instance, I photographed it on May 16, 2016. I present it here only to contrast it with the new piece that had taken over its location as of our December 9, 2017 visit. Similar. But definitely not the same. A changed sculpture installation in 798. In the absence of actual knowledge, it is easy to speculate on how and why the earlier sculpture has been replaced by this less unnerving one. As reflected in other images shared in this post, one can track not only the ways that the in-your-face quality of 798 has been domesticated, but also the way that 798 is, for instance, becoming a place where children are part of commercial mix. The new work clearly articulates with the older one for anyone who had seen it previously, without being quite so difficult to explain to the uninitiated. Does anyone know the actual story? December 9, 2017. Photograph by Jason Baird Jackson. Porcelain is, today, a familiar material of dishes, figurines and tiles. The qualities of such objects – fineness, artistry – point to similar qualities in their buyers and users. Certainly, that is the role of material objects in systems of social distinction. Yet, this view often presumes that material qualities pre-exist the social, and need only be recognized. In some versions of the current ontological debate in Anthropology and Cultural Studies, materiality is the ultimate limit on cultural interpretation. I argue, instead, that the properties of materials are not fixed. They are semiotic achievements reached by a dialectical process of embodied social interaction with objects within political and economic institutions. The histories of “porcelain” in Europe show the varied qualities it has embodied as it has been swept up – and translated – into diverse regimes of knowledge, state economic strategies, and politico-ethical discourses. Translations of porcelain destabilized attributed qualities, changing “it” as sign and as material. The Council for Museum Anthropology is seeking submissions for its inaugural conference taking place in Montreal from May 25-27, 2017. This will not be your traditional conference experience! “Museum Anthropology Futures” seeks to spark critical reflection and discussion on (1) the state of museum anthropology as an academic discipline; (2) innovative methods for the use of collections; (3) exhibition experiments that engage with anthropological research; and (4) museums as significant sites for grappling with pressing social concerns such as immigration, inequality, racism, colonial legacies, heritage preservation, cultural identities, representation, and creativity as productive responses to these. The conference will have several sessions each day that all participants will attend, as well as one period each day with breakout sessions like workshops and formats that would benefit from a more intimate setting for dialogue and collaboration. We are seeking session proposals that are different than the usual call for papers – see session descriptions below. Feel free to email us with questions at museumfutures2017@gmail.com. 5) A description of your session (max 150 words) Specific requirements for each format below.